As such, just try saying MMT without saying ‘Mmm’! Clearly MMT, which has actually been around for decades, is currently a hot topic at the highest levels. However, even a cursory glance above shows that it is not something there is any agreement over. By contrast, it’s divisive and very controversial. One can also see that public interest in MMT is spiking too. 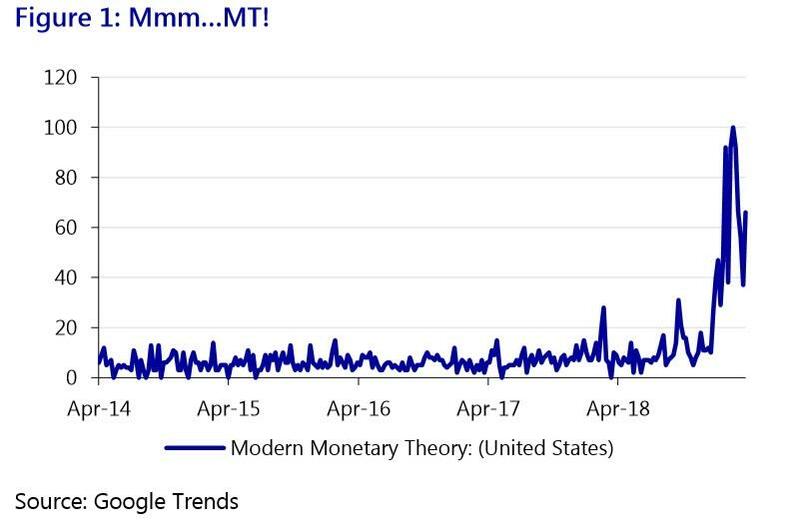 Google Trends interest over time in “Modern Monetary Theory” has shot up since the end of 2018 (see Figure 1) despite it being an obscure, dry, theoretical--and yet controversial-- economic-policy framework. That is arguably the case in the US because MMT is now politically linked to US Democratic Congresswoman Alexandria Ocasio-Cortez’s “Green New Deal”, with its multi-trillion USD price-tag and radically transformative agenda. We can agree interest in MMT is picking up, and not everyone likes it, but what exactly is it? So let’s start with some basics of what MMT believes before proceeding any further. As we shall see, the premises of MMT are very simple – but the implications for policy and for markets are staggering. For example, if a major war were to break out tomorrow, governments would immediately run very large budget deficits without worrying about how to finance them via taxation first. History shows this to be the case. So the issue is then political: what constitutes an emergency that society should focus its resources on? Of course, this is highly controversial in an age defined by worries over high public debt levels and a push for ‘prudence’ and austerity; and readers who pay taxes will not be happy with the idea that these are destroyed rather than spent! So is MMT a “magic money tree”? No. MMT is more nuanced than that. For example, it recognizes that there are indeed limitations to what a government can do fiscally. Primary is a real resource constraint: if there is no spare capacity in the economy, or the materials the government wishes to procure do not exist, fiscal sovereignty is an illusion. A poor country with no natural resources or industry and with an uneducated population cannot simply print money to build infrastructure or good universities. However, if a developed economy is suffering from high unemployment and/or a low level of capacity utilisation the same argument clearly does not apply. MMT also recognises there is another limit to the government’s ability to finance itself: inflation. MMT fully recognises inflation is not desirable above a certain level and once self-financed fiscal stimulus exceeds what the real economy can supply such spending would have to be cut back to avoid damaging wage-price spirals – or taxation would have to increase. Even so, from a traditional economic point of view there are still many obvious criticisms of MMT. First, is the argument that governments cannot create money because true money is exogenous: the public being able to conjure up money is ‘voodoo’. Anyone believing there is no such thing as a free lunch has a powerful gut reaction to MMT. Although we use the word ‘Modern’ in MMT, this is a very old debate. Plato argued money was a representation of value rather than real, while Aristotle countered money should be a real commodity itself. In our age of fiat currencies, credit cards, and now digital currencies, economics textbooks still teach the history of money as being barter > gold > credit. In other words, we are Platonic but like to think we are still Aristotelian. By contrast, MMT is based on chartalists such as Knapp (1925), Lerner (1943), who argue money is always a political construct. Polanyi (1944) and Graeber (2011) also demonstrate the actual historical record of money is chartalist: there was never a transition barter > gold > credit; with the exception of the gold standard (18151931) the norm across human societies has been to start with local credit, rarely repaid, in order to keep the economy moving. That is a tradition which MMT builds on. That is also a red pill/blue pill moment for many! Second is the argument that MMT is simply “Keynesian” fiscal stimulus via bond issuance renamed, already a well-established theory even if has become politically unacceptable in many countries obsessed with austerity. However, the ‘taxation is not needed’ argument takes us well beyond simple Keynesian fiscal multipliers. MMT notably also does not believe in the ‘loanable funds’ view that bank loans require savings first, and that banks intermediate between savers and borrowers rather than creating money (in the form of debt) when they make loans de novo. Notably, while economics textbooks still teach loanable funds, the Bank of England admits this is not how money creation and banking operates – it is de novo; MMT then posits the government has greater powers of money creation than banks in this regard given public liquidity does not require a liability to be created at the same time. If a bond is issued under Keynesian theory then a liability and an asset are created; but that bond can be bought by the central bank with electronically ‘printed’ money and the liability de facto removed under MMT. Just think of the trillions of USD of QE injected by central banks, which is now NOT to be reversed by QT. Yet that leads to the third criticism, the government is not the actor that would finance itself: that role falls to the central bank. Naturally, central bank independence would have to end under MMT. While a dual inflation and fullemployment mandate already exists at key central banks such as the Fed, and inflation-targeting might still be built into a new MMT policy framework, clearly the central bank would be primarily focused on aggregate demand by providing blank cheques to government spending, not CPI. Fourth, and a crucial corollary, interest rates become largely irrelevant under MMT. The cost of money would not matter as much as the quantity of money (i.e., the supply of funds into the real economy fiscally). Indeed, MMT suggests that interest rates should be set to zero. If not, mixed fiscal-monetary targets would prove confusing. Yet a fifth issue then emerges: how would the government yield curve respond under MMT? The curve would start very low and flat. However, what if MMT succeeds in achieving inflation? Bond yields would rise – and could the government then cover higher debt-servicing costs if the resources/inflation threshold has been successfully breached, meaning MMT must be ‘turned off’? If so, the economy would lurch back into recession again – necessitating more MMT! Or would we instead need to see bond yields capped – as in Japan today under their policy of Yield Curve Control (YCC)? If so, that would likely destroy a real market for benchmark government bonds. Of course, the government yield curve is not the only one that matters. How would the corporate bond market respond to this kind of MMT environment? Would the state have to step in and cap private-sector bond yields too? And what about asset prices such as property? What would be done there? There are also other issues. Consider that a key part of MMT is a commonly-linked policy of funds being used for a public Employer of Last Resort or Jobs Guarantee programme to generate non-inflationary full employment. That is certainly part of the proposed US Green New Deal, for example. The issues here should be obvious. While the Phillips curve is broken under our present global model that strengthens capital vis-à-vis labour bargaining power, under MMT it would rapidly return. Wage inflation would then rise again – and all of the interest rate/yield curve issues mentioned above would arise with it. At the same time, as the government plays a larger role in the economy, as in the proposed Green New Deal, it risks genuinely crowding out the private sector, not from a financing perspective but in physical terms. Even if the state is merely financing private firms to do the required work, in infrastructure, for example, elements of political direction would no doubt still occur over time. Clearly, the overarching question that needs to be answered is what kind of institutional architecture can be created for MMT to work through the economic cycle without warping markets (further than QE already has)? How can one ensure that fiscal taps are turned off once inflation appears, and that the state does not distort both the real economy and financial markets? Fiscal policy has far longer lag times than interest rates, for example: would it really be more efficient to build half a bridge and then stop because inflation rose too fast? In short, this would require an entirely new political economy that remains elusive in its definition if not in its ambition: that has been clear since Lerner (1943) and Kalecki (1943). Yet as shown, that utopian new institutional framework could produce its own instability even as it cures our present New Normal. While this is a strong theoretical rebuttal of MMT, interest rates in Japan and Europe are nonetheless already negative, and in other economies the drift towards ‘Japan-ification’ seems inexorable. In short, we seem to be heading in the direction for an MMT starting base (zero rates) whether we like it or not. Once the US Fed starts cutting interest rates again, that dynamic will become even more obvious. This is no surprise to MMT: Kalecki (1943) recognised giving capital too much power relative to labour would ultimately lead to such outcomes decades ago. For MMT sceptics consider that the BoJ, despite its denials of using such a policy, already holds around 43% of the JGB market and effectively finances Japan’s permanent, large fiscal deficits. Likewise, the Chinese economy is a quasi-MMT experiment given its quantitynot-price fiscal-monetary policy mix has been responsible for much of its growth since 2008 (e.g., Chinese total social financing was 9% of GDP in Q1 2019). At the same time, there is a broadening consensus that even extraordinary central-bank monetary policy has done all it can do and more fiscal measures will be required going forwards. In turn, that is linked to growing concern that our current socio-economic paradigm is unsustainable. Such a pessimistic view was also stated at Davos in January; hedge-fund manager Ray Dalio has argued US capitalism is structurally broken and its wealth and income inequality is a “national emergency”; and the OECD states “Today the middle class looks increasingly like a boat in rocky waters. Governments must listen to people’s concerns and protect and promote middle class living standards,” arguing in favour of significant fiscal expansion despite zero rates and high debt levels. In short, all these paths seem to lead us back towards MMT one way or another, politically, even if there is a refusal to accept the broader implications and assumptions of that framework. Of course, there is one other huge issue to address: external restraints. If we were to see a larger MMT-financed public-sector deficit this would suggest that there will be a current account deficit too. That is because of the following known identity: Current account balance = Public-sector balance + Private-sector balance. It is possible a large public-sector deficit could see the private sector run an offsetting surplus as profits and wages rise rapidly – as MMT sectoral balances imply. However, at the microeconomic level that implies the need for protectionist policies to keep the benefits of extra domestic liquidity at home, e.g., tariffs, subsidies, or non-tariff barriers - just as we see in China today. Without that, MMT leans towards larger current-account deficits. Crucially, current-account deficits represent the kind of resource constraint that limits MMT. The US, with its “exorbitant privilege” of the USD as global reserve currency, would be able to use MMT to expand its fiscal deficit: it can borrow in its own currency; and MMT would see it importing more from other countries who would need to hold USD reserves as a result. Yet smaller economies/emerging markets could not use MMT without being punished by financial markets. Their current-account deficits would have to covered with foreign borrowing, and the more MMT they used, the more their currency would weaken. Recent volatility in the Turkish currency after a period of fiscal stimulus and external borrowing, absent MMT, shows the dangers. Crucially, the only way to avoid such risks would be to run a private-sector surplus resulting in a currentaccount surplus. Consequently, in a global downturn requiring MMT smaller economies would have to choose between no MMT; using MMT and protectionism; or coming under the wing of currency blocks who can run MMT. Notably, that was a development we saw in the 1930s when global trade fragmented into gold, Sterling, Nazi, Communist, and Yen blocks. As such, MMT appears to offer a painless way to address inequality within the US economy, but it could reinforce an international pecking-order of winners and losers, worsen global inequality, and break-up global trade. Indeed, MMT could even cause the USD to lose its “privilege” over time, which would again risk fragmenting global markets. That is unlikely, at least near-term given the lack of any credible USD alternatives, but it remains a longer-term risk one cannot ignore lightly. Indeed, Japan and China are already heading down the MMT road, even if they deny it; the inability of central banks to reverse QE via QT suggests the same underlying dynamic; and once the Fed starts cutting, the volume of these discussions will only increase further. Of course, the rise of global political populism is likely to accelerate that development given MMT promises easy answers to complex socio-economic problems. Certainly, when looked at in detail MMT is not the simplistic ‘free money’ argument that some of its critics present it as, and arguably contains some fresh, if old, economic thinking that could provide some solutions to some of our structural problems. At the very least, an MMT critique of our current paradigm is a useful staring base for everyone. However, it can also be seen that MMT could create as many problems as it solves when dealing with our New Normal. From increasing market volatility to destroying functioning bond markets; and from revolutionising our entire political economy to potentially shattering world trade, the risks are there to be seen if one looks carefully enough. MMT is arguably not something to be dismissed out of hand; but neither is it something to be embraced without question. Indeed, just try saying MMT without saying ‘Mmm’!